Erik Karlsson really enjoys hearing his named called over the PA systems at arenas all over the league. The 21-year-old, all star defenceman of the Ottawa Senators has been scoring big goals and setting up teammates on a consistent basis which puts him atop all defencemen in scoring with 43 points in 44 games and a 10 point cushion on the next closest d-man, Brian Campbell. 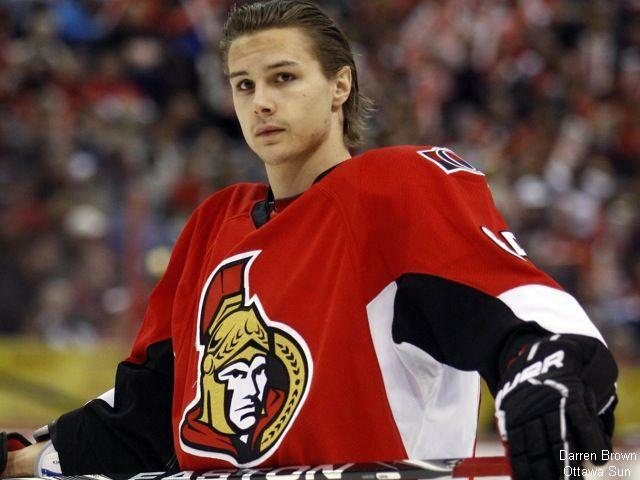 Karlsson, the 15th overall draft pick in the 2008, is already one of the top puck-moving defencemen in the league. With his smooth skating ability and exceptional hockey sense, Karlsson always seems to be so calm and patient on the ice. He can saucer pass with the best of them in the league and when he decides to shoot the puck, it's always a bomb of a shot. He's the ultimate powerplay quarterback. Standing in at just under 6' and 180 pounds, Karlsson is not the biggest guy on the ice, but once he gets stronger and more experienced in his own end there is a great chance he will be taking home a Norris Trophy one day. In many ways he is Mike Green 2.0. In fact, Karlsson could be looking at Mike Green numbers when he looks for a new contract this summer. Karlsson's on pace to shatter the Sens record for single season defensive scoring set by Norm Maciver in 92-93 with 63 points, and that could cost the Sens north of $5M this offseason. As a Maple Leafs fan it is hard to write praise for a Senators player. But thanks to free online streaming of every hockey game, I have watched a lot of Karlsson's games and boy is he ever impressive with the puck. Maybe I notice him so much because his skills, or because he's one of the league leaders in ice time with over 25 minutes/game. Either way, I'm sure I won't be alone in looking forward to watching him and his slick moves at the All-Star game in a few weeks. I take him every week in my weekly pool with the Score. 60 points in 51 games from a team who was thought to finish last overall unanimously before the season began (and even over the first couple weeks of the season).